Bloodstained: Ritual of the Night has become a bit of an E3 staple. Koji Igarashi’s Kickstarter-funded Castlevania successor was supposed to come out in early 2017, but delays have piled up, and so it was that I sat down to try out the third (and hopefully final) Bloodstained demo at E3 2018. This latest demo, which will go out to Kickstarter backers later this week, featured three connected areas – a leaky ship (which we’ve seen before), a village, and the entrance to the game’s main castle. Personally, I only managed to make it to the village during my allotted time, but, sneaking a peek at some of my fellow tester’s screens, it seems the demo culminated in a one-on-one showdown with a samurai-like boss, who’s quite a departure from the towering sea witch you face at the end of the ship stage. If you’ve ever played one of Igarashi’s Castlevania titles, particularly the ones on the Nintendo DS, you’ll be right at home here. The levels, particularly the ship, expand horizontally and vertically, with new segments of your map being gradually filled in as you venture forth. Carefully studying the map for doorways and passages you haven’t passed through is key to progressing, with plenty of secrets littered throughout. The exploration is satisfying, in that classic sort of way, although, sometimes the game’s graphics don’t make passages, platforms, and individual rooms as distinct as they should be. Main character Miriam controls fairly well – her jumps feel a tad floaty, but combat is pleasingly responsive. You can wield various weapons, from guns, to katanas, to (of course) whips, and a variety of different powers can be unlocked by collecting magical Shards from fallen enemies. These powers are used to solve the game’s simple puzzles – for instance, using a fire-based ability allows you to light a cannon, which will blow open a new way forward. The demo also introduced some of the game’s cast, and some new dialogue, which was, honestly, pretty skippable stuff. If you’re hoping Bloodstained: Ritual of the Night will take the Metroidvania genre to bold new places, you may want to temper your expectations. On the other hand, if all you’re looking for is an HD follow up to Igarashi’s DS Castlevania games, you’re probably going to be pretty pleased. 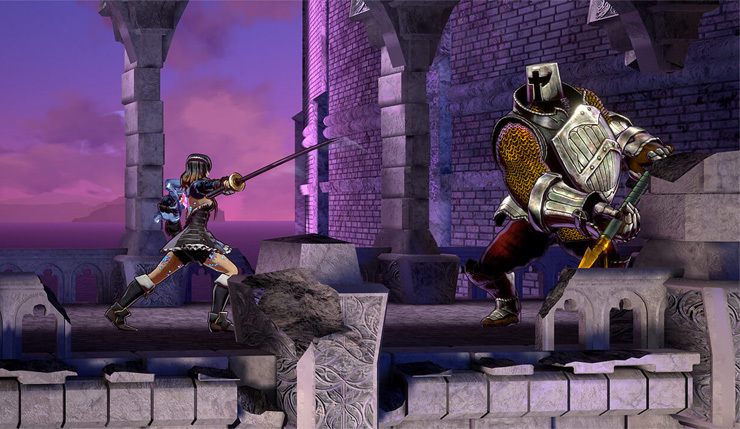 I have no idea how much longer we’ll have to wait for Bloodstained, but it seems to be shaping up well. This latest Bloodstained demo gave us more of a taste of the story. Some of the background info is definitely interesting – why did you decide to set the game during the Industrial Revolution? The reason why we chose the Industrial Revolution, is it has that sort of gothic horror taste. Also, when I thought about the Industrial Revolution, and what were the biggest changes from that era, I thought about how it would affect people, particularly those who might be at a disadvantage as technology is moving forward. I realized a lot of people who are spiritual or believe in magic would be at a disadvantage, because people are becoming more materialistic and rational. It would be interesting to have that Industrial Revolution vs. alchemy conflict, so that’s why we chose the setting. Has it been fun to create an entirely new universe? As opposed to Castlevania, which was sort of an amalgamation of existing things? It was really fun creating this new universe. With Castlevania, it’s always one pattern, and so it’s very easy to make a new game based on that same lore. But with Bloodstained, it’s a completely new universe, and at first you need to explain what the world is about, and that’s the hardest part. So, that’s why, to explain everything, I had to create so many different characters, so much background for each character. That was really tough, but it was also very satisfying. We saw a number of new characters in the demo – can we expect Bloodstained to have a deeper, more complex story than your Castlevania games? Even in Castlevania there’s so many different characters, but, of course, everybody knows defeating Dracula is going to be your final goal. With Bloodstained, that’s different. There will be more mystery, more twists. Each character will have their important role in that. The demo consisted of a series of three areas, but what’s the scope of the full game? How much time will players need to devote to the game? When we’re talking about size, it’s best to talk about hours of gameplay. Right now, the demo with the three areas is about an hour of gameplay, and the full game will be about 10-times more. If you play from start to finish without exploring or collecting items, it will be roughly 10 hours. Once you reach the castle, there will be much more exploration. I enjoyed trying out some of the Shard powers during my playtime. How many Shards will there be in the game, and do you have a personal favorite? There are many more types of Shards than you saw in the demo, and you’ll also be able to power up abilities by collecting more of the same type, so there’s a lot of depth. My favorite is probably Throw Axe, which lets you attack enemies with a really big axe. “Metriodvania,” or “Igavania,” games have seen a real resurgence in recent years, particularly in the indie space. 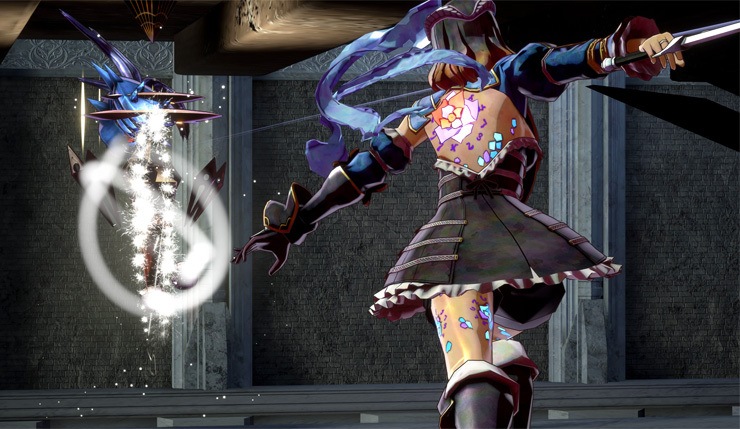 What sets Bloodstained apart in 2018? Bloodstained is a Kickstarter project that was funded because of people wanting this type of game, that I personally haven’t been able to make in years, so there isn’t a huge unique point to Bloodstained. It’s about keeping that same experience that have always been in my games, and to improve on that. Looking at other games similar to Bloodstained on the market, is there anything you feel they do wrong? Are there any special tricks only the master of the genre knows? There isn’t necessarily anything missing from indie games in this genre. Each individual indie creator is making the game they think is best, putting in what they’d like to see. But, many people want the original style of Metroidvania that I used to make, so we’re trying to give them that. If Bloodstained: Ritual of the Night is a success, are there plans a sequel? A full franchise? 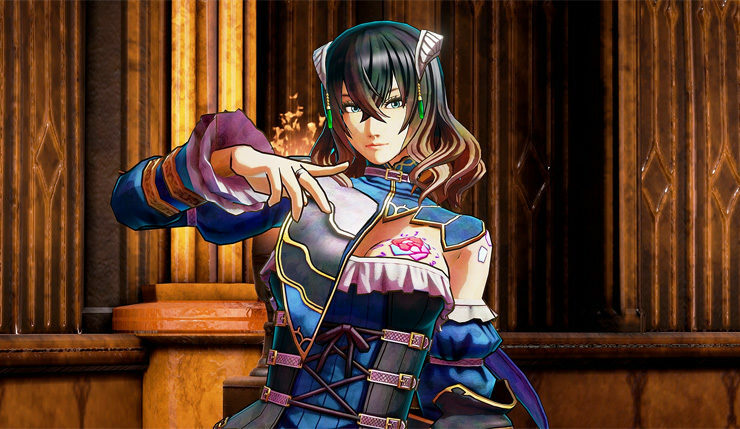 Right now we’re focusing on Bloodstained: Ritual of the night, to make it as good and successful as possible, and if it is, we’d love to create a sequel. You recently released the 8-bit-inspired Bloodstained: Curse of the Moon to solid reviews. Would you consider making other retro-style Bloodstained games? Perhaps 16 or 32-bit games? That’s an interesting concept. Of course, right now we’re doing 2.5D with Ritual of the Night. Trying something 16 or 32-bit, I think it depends what platform we’re focusing on. It’s something we’d want to play around with, again, depending on the platform. Bloodstained: Ritual of the Night is coming to PC, Xbox One, PS4, PS Vita, and Nintendo Switch sometime in 2018. The latest backer beta, for those who pledged $60 or more, will be available on June 28.